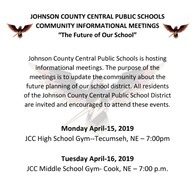 Johnson County Central Public Schools is hosting informational meetings. The purpose of the meetings is to update the community about the future planning of our school district. All residents of the Johnson County Central Public School District are invited and encouraged to attend these events. Monday, April 15th, 2019 JCC High School Gym (Tecumseh, NE) -- 7:00 p.m. Tuesday, April 16th, 2019 JCC Middle School Gym (Cook, . . .
HOSA is selling T-shirts to help raise money for an adapted bike for Flo, daughter of Daisy our high school secretary. The bike that they are looking at for Flo will help compensate for her balance problems, which make it impossible for her to ride a regular bicycle. This sort of adapted bicycle is quite expensive (around $1750), thus the fundraiser. Any money above the cost of the bike will go to Daisy to help with ongoing travel . . . 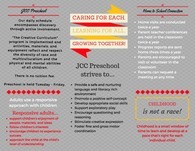 The Johnson Country Central Preschool Program has Pre-K openings available for the 2019-20 school year. If you are interested in enrolling your child, please print an application or pick up an application from the elementary office in Tecumseh. Your child must be four-years-old by July 31, 2019 to enroll in the preschool program. The full-day program is in session Tuesday through Friday. If you have any questions, please call the . . .
Johnson County Central has the following openings for the 2019-2020 school year: High School English Middle School English Head HS Volleyball Additional coaching and sponsorships may be available. The High School is located in Tecumseh and the Middle School is located in Cook, both are within an hour of Lincoln and Omaha. Applicants must have a current Nebraska teaching certificate with appropriate . . .
All are invited to attend our Annual Title 1 Meeting being held on Thursday, April 18 at 4:00 p.m. in the JCC Elementary School Library in Tecumseh. The purpose of this meeting is to review and/or update our School-Parent Compact, Title 1 Parent and Family Engagement Policies, and our overall Title 1 Schoolwide Program. Your attendance is most appreciated to help improve our program. Please contact Julie Beach , Judi . . .